Originally I thought the desk had been something Mom had picked up along the way, but it turns out that the piece of furniture goes back at least to my paternal grandmother, and possibly to my great-grandmother (Mom said it was kept in Mamie’s room, which became mine when we moved in with grandma when I was 3). Apparently it was there when my aunt (my dad’s baby sister) was little and she used it growing up, but didn’t know where it actually came from, either. It was the place coloring books and crayons were kept for the grandkids until it eventually moved with us to Florida. I’m happy to report, however, that this tale has a happy ending. I’ve spent the last 2 weekends giving this old desk a makeover and not in the spray-paint it glossy white sort of way that seems to be so popular these days. No, no, I stripped what was left of the finish from it, had Todd cut a new, solid bottom for it out of matching oak (once we cleaned it up Todd was able to identify what sort of wood the desk was made out of from one of his book), sanded it 4 times, stained it (and parts of myself) a deep, rich brown (Kona, to be exact), and am now in the process of giving it a full 3 coats of polyurethane varnish so that it will be nice and pretty for a long time to come. You see, it has a very important role to play this fall, as we’ll be including it with our wedding decorations (right now the plan is for it to hold the programs). Until then, though, it will sit in our living room as I’ve recently made room for it by moving one of the armchairs into my office. Coincidentally, that corner is also the one that holds the silver platter from my Easter remembrances from that same grandmother’s house, so it’s fitting they’ll be reunited again. 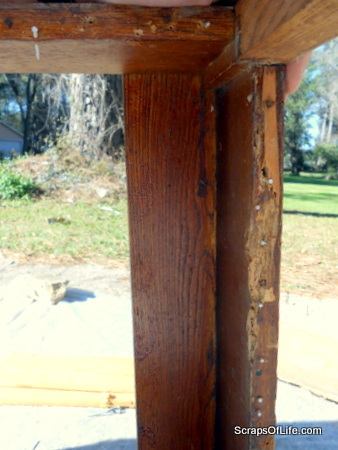 Having accomplished this task to the best of my abilities, am I ready to hang out my restoration shingle? Not hardly. I’m not going to lie, this was hard, sweaty work and not something I’d like to spend every weekend doing. I will say, though, that the getting started parts where Todd and I were working together to remove the 50+ nails holding on what was left of the original and repaired bottom of the desk was quite fun. So it’s not out of the question that we might tackle something like this in the future. Ready to get started, this baby has seen some hard times. 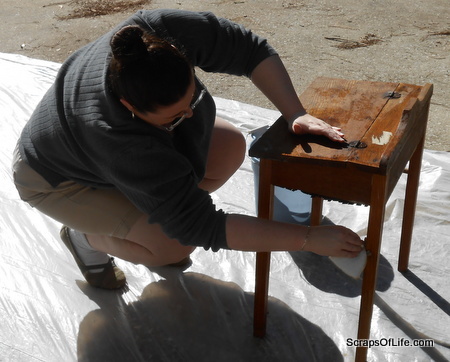 Before you do anything you have to give the furniture a good wipe-down to remove any surface dirt and grime. Some of the screws were stripped but this last one was just plain stubborn. 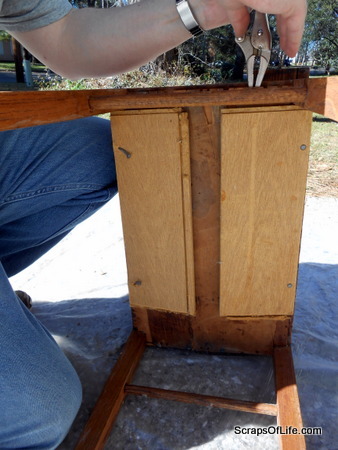 Here’s a shot of the half-assed repair Mom & I did many years ago–it’s not pretty but it held! 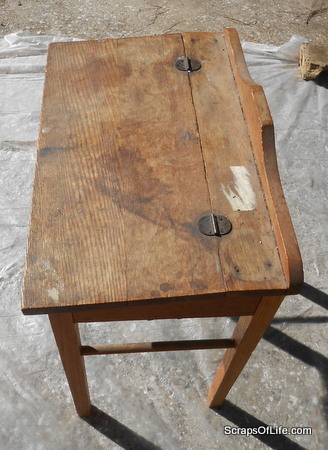 Our various repairs over the years meant that we pulled over 50 small nails of various types from the bottom of the desk. After the new base was added we puttied the sections that were badly damaged. The stripping gel I used was water-based, eco friendly, no-VOC, etc. Which means it does a good job but you do have to work a little harder than the heavy-duty chemical strippers. Still, it got the job done in the end. 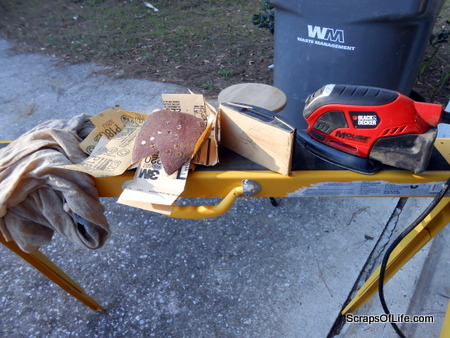 I used the Mouse power sander to get some of the residual finish off, then used 4 different grits of sandpaper to sand the entire desk super-smooth. After each pass a damp flour-sack towel was used to wipe off the dust. After 4 rounds of sanding (and an album and a half of MeatLoaf to keep me company) the surface of the wood was smooth enough to not even snag stockings! 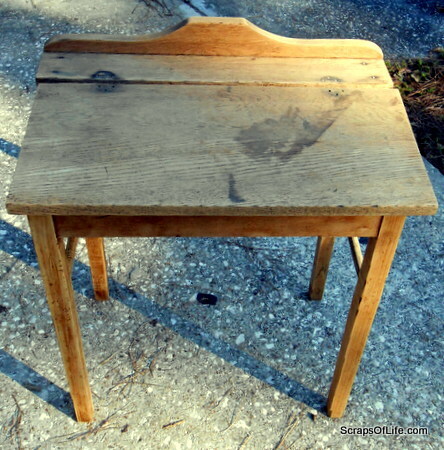 When we were all much younger, my middle brother was jumping on the bed, missed, and landed with his mouth open on the corner of this desk. 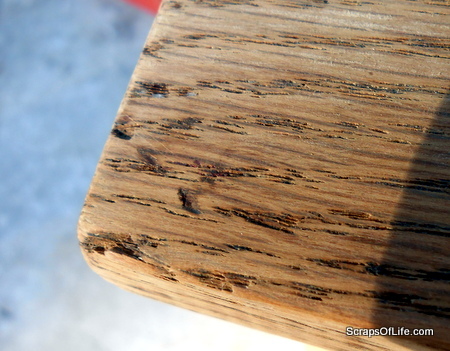 Even after sanding, 3 of the 4 tooth imprints are still easily visible in the corner of the desk. We opted not to fill those, considering it a part of family history. 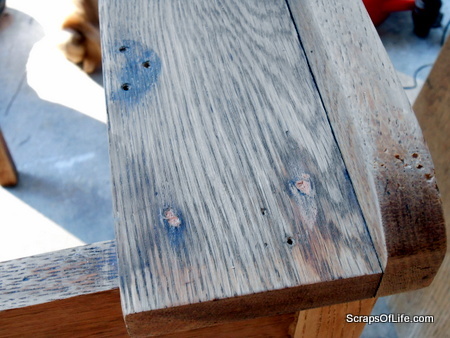 Some nicks and nail depressions got filled with wood putty to make the final surface smoother. Todd cut a new bottom out of 1/4″ plywood with a matching oak veneer. 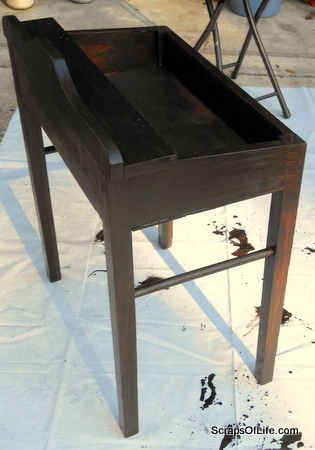 Once stained it started to look like a nice piece of furniture! 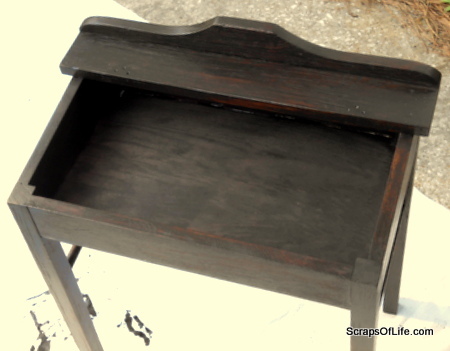 Another view of the stained desk. There are some natural variations along the wood, but I’m okay with that. 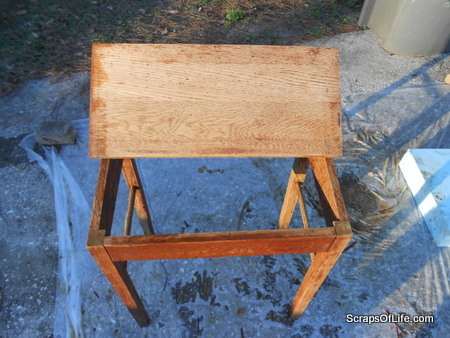 What’s left is 3 coats of polyurethane and adding the hinges back on with new screws. 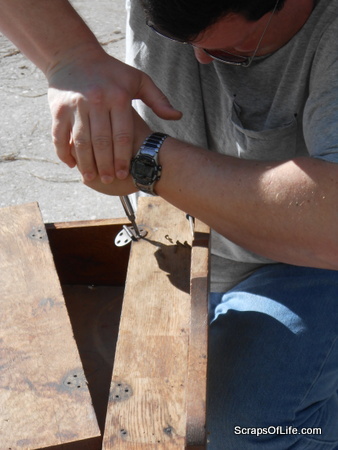 We were able to salvage the original hinges, though they still need a bit of cleaning. I don’t want to clean them up too much, though, since then they might look too new. I’m not going to do any distressing–something tells me that will happen over time as we’re not exactly gentle with our stuff–but I think if it’s lasted at least 50 years and many kids that we know of, this facelift should hold it for quite some time to come. Almost long enough to try something like that again, right? That’s so cool! It’s a real piece of history!